The start of Cleveland Indians baseball brings the season of concurrent events to the Gateway District as Rocket Mortgage FieldHouse and Progressive Field welcome thousands of fans to see the Cavs, Monsters and Tribe in action. With the exciting activity, coupled with construction taking place on The Q, fans should plan and prepare for altered traffic patterns, heavy traffic conditions and parking limitations around the Gateway District. Carpooling, arriving early, using RTA or Uber is strongly recommended. Friday, April 6 – Progressive Field: Cleveland Indians vs. Kansas City Royals at 4:10 p.m. / Rocket Mortgage FieldHouse: Monsters vs. San Antonio Rampage at 7:00 p.m.
Sunday, April 8 – Progressive Field: Cleveland Indians vs. Kansas City Royals at 1:10 p.m. / Rocket Mortgage FieldHouse: Monsters vs. San Antonio Rampage at 3:00 p.m.
Wednesday, April 11 – Progressive Field: Cleveland Indians vs. Detroit Tigers at 6:10 p.m. / Rocket Mortgage FieldHouse: Cavaliers vs. New York Knicks at 8:00 p.m.
Thursday, April 12 – Progressive Field: Cleveland Indians vs. Detroit Tigers at 6:10 p.m. / Rocket Mortgage FieldHouse: Monsters vs. Manitoba Moose at 7:00 p.m.
Friday, April 13 – Rocket Mortgage FieldHouse: Monsters vs. Manitoba Moose at 7:00 p.m. / Progressive Field: Cleveland Indians vs. Toronto Blue Jays at 7:10 p.m. Doors for all Cavs games at Rocket Mortgage FieldHouse open two hours before tipoff, and 90 minutes prior to Monsters games. The Progressive Field right field gate opens two hours prior to first pitch for all Indians games. Parking: Also note that parking in the Gateway East Garage for Cavs and Monsters games for the remainder of the 2017-18 season is at capacity and will be available for those with pre-assigned passes and pre-paid parking tickets only. Pre-paid Gateway East Garage parking tickets for Cavs and Monsters games are sold-out. For additional parking options in the Gateway District, visit TheQTransformation.com. Huron Rd. 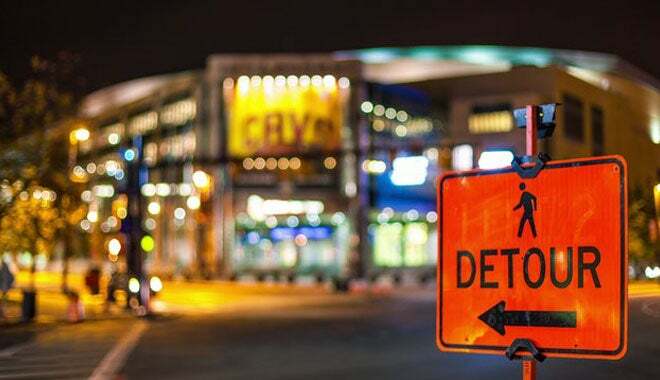 in front of The Q, from Ontario St. to E. 6th St., is reduced to two lanes because the eastbound lanes adjacent to the arena are closed as part of the construction zone. Both lanes have been converted to one-way directional traffic. Prior to every event at Rocket Mortgage FieldHouse and Progressive Field, beginning at the Ontario St./ Huron Rd. intersection, the two lanes are ingress only onto Huron Rd. traveling eastbound toward the Gateway East Garage/Prospect and E. 9th St.
At the conclusion of every event, the two lanes are dedicated to westbound traffic only. Vehicles departing the Gateway East Garage at the Huron Rd. exit will only be permitted to exit left onto Huron Rd. to travel westbound. The Cleveland Police will work to efficiently manage traffic flow during ingress and egress for events and will exercise judgement to change traffic patterns as necessary to facilitate a continuous flow of vehicles. Detailed information on how construction will impact fans attending games and events at Rocket Mortgage FieldHouse is provided at TheQTransformaton.com.